On top of Datamath's web page (http://www.datamath.org/, Retrieved May 24, 2016), the website announced that a logarithm bug for several Texas Instruments has been addressed and corrected. There is a big box on top the page which will you lead you to the article. This affects the basic level (one-line display) scientific calculators, from the TI-35X and TI-36X from the early 1990s to TI-30Xa of the 2010s. 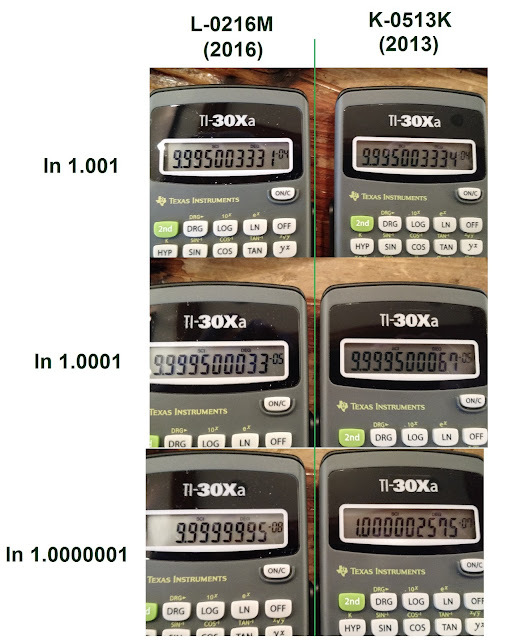 The bug is present when you calculate the natural logarithm of numbers between 1.000000001 and 1.01. Datamath reports that the bug has been fixed in 2015; hence the TI-30Xa and TI-30 ECO RS (the latter not in TI's United States product lineup) manufactured 2015 and after are working properly. In testing the two TI-30Xa's I have (manufactured in 2011 and 2013, I think), it seems that they have the bug. I might buy a new revision to test it. Update (5/25/2016): I purchased a new TI-30xa today (manufacture number? L-0216M, the package had a date of 2015) to test whether the bug has been resolved. I put this one and an older version (K-0513K – 2013) to the test. To get the full decimal result, I put both calculators in scientific mode. Judging by these results, the bug appears to have been resolved. 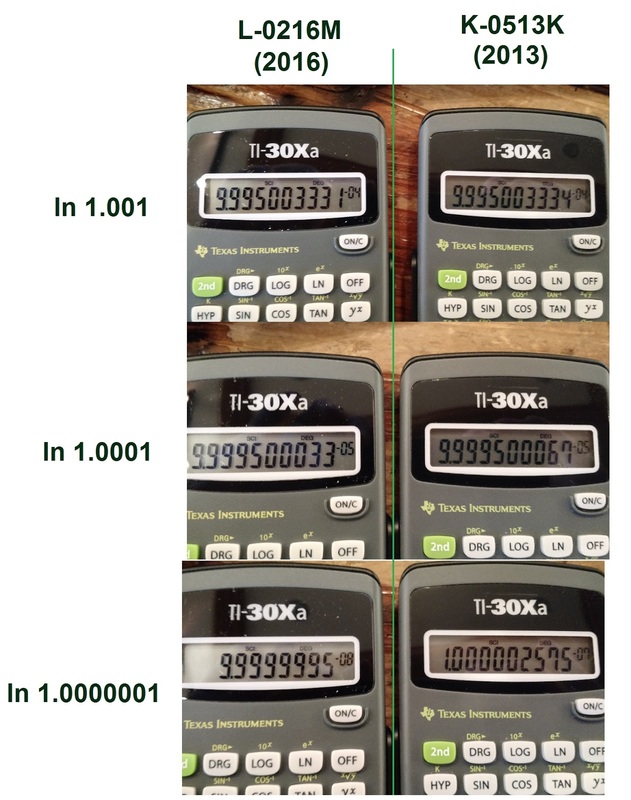 A comparison between TI-30Xas. The left is the 2016 (new) manufacture, the right is the 2013 (old) manufacture. The results on the left are correct. I have recently purchased a TI-30Xa,made in the Phillipines mfr no. L-1116M. No date, but the bug has been fixed. This bug appeared again! But not in Ti calculators. I've recently bought a Brilliant BS-130 (Casio MS series clone), and it has a similar bug again. The bug is reproduced in similar conditions, but gives slightly different results. PS, do these two TIs give identical results in the forensics test? A similar bug is present in Citizen SR-260 and SRP-265 models. Absolute Value: Does |x|^2 = x^2?